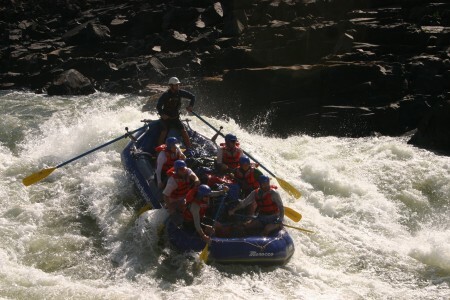 A whitewater rafting trip down the Zambezi is one of the world’s classic adventures. Our guests love the chance to relax and truly unwind on a seven day trip down the Mighty Zambezi. It offers many opportunities a shorter trip does not with awe inspiring scenery, wildlife, gigantic beaches and one incredible conclusion – a flight up river, over Victoria Falls to land at your hotel with your fellow travelers. Here are a few of the reasons we (and our guests) love this trip. Animals: Whilst on shorter trips you do occasionally see some wildlife such as small crocodiles and klip springer, a seven day journey offers a vast array of incredible wildlife and bird life. If you are an avid bird watcher, our team of excellent guides are hot on the many diverse and spectacular bird species. Goliath heron, rock pratincole, white fronted bee eaters, African Fish Eagles to name just a few. Bring your binoculars and enjoy. 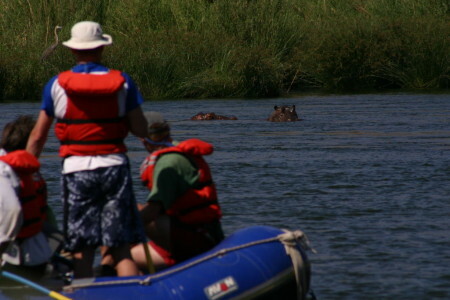 We also are privy to seeing hippos at close range on our last day as we approach Matetsi, which is simply spectacular. Baboons, various gazelle species and even elephants are occasionally seen. A gift for us and our guests given the few number of trips on this part of the river. Checking out hippos on our final day on the water. The Proposed Batoka Dam: Sadly the first 4 days of this trip may soon be under water if the joint Zimbabwe and Zambia Batoka Dam becomes a reality. Initial surveying has begun, road building has begun, airstrips are being built. Will it really happen? 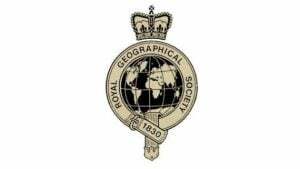 We hope that there will be a strong case for alternative methods of power generation to leave this wonderful area untouched for future generations. The Batoka Dam is due to be placed at Chabango Falls, some 64 km from Victoria Falls will be approximately 181 metres tall and have two dams (one on the north side of the river and one on the south side) generating 1600MW. Our advice? Explore this wonderful area whilst its still free from construction. 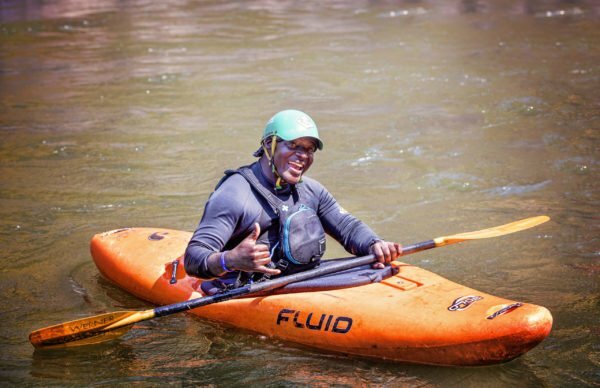 Layover Day: Whilst we all love rafting, a break in the trip to take a hike, go fishing, relax on the beach to read a few pages of your book, or even the opportunity to get Lovemore (our wonderful safety kayaker) to teach you to kayak is always welcome. 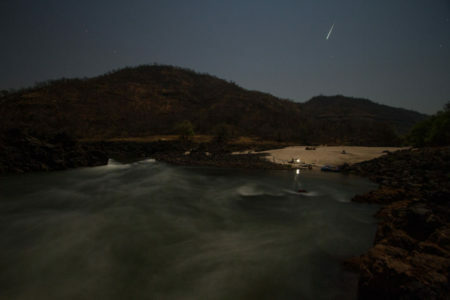 We camp in a stunning place on this layover day, where there is a stunning branch of the Zambezi leaving a beautiful and crocodile free pool to swim in as well. As the guides have all day as well (so they get a chance to relax too) they will whip up an amazing meal for you on the banks of the river, such as gourmet burgers and chips or even individual pizzas. You’ll love the way an extra day of relaxation makes you feel. 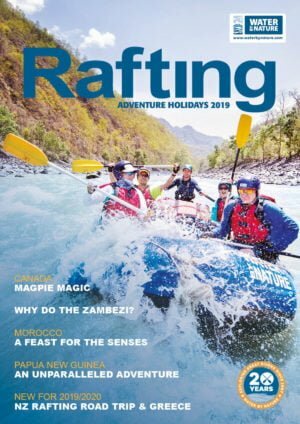 Zambezi Whitewater Highlights: Despite there being many rapids on the first day of the Zambezi, some of the most challenging and spectacular whitewater rapids feature further downriver. Many of our guests love the fun and excitement of Upper Moemba on day three of this trip, where we run a ‘sneak’ line away from the main flow on the river, but it will still offer PLENTY of excitement for even the most thrill-seeking adventurer, as we arrive at yet another spectacular camp a short walk away from the stunning Moemba Falls. The following day, guests and guides are up for the biggest and best challenge of the trip with the iconic Ghostrider rapid featuring 3 enormous waves before finally reaching the calm section below. Ghostrider. Saving The Best Until Last. An EPIC Helicopter Flight: We all love adventures, lets face it, but it is VERY nice to get off the river after a few days and use a regular ‘loo’ and stay in a hotel with a comfy bed. Right? All of our Zambezi trips end with a stunning helicopter flight back up part of the river (low level) and a flight over the iconic Victoria Falls before landing at our hotel, the spectacular Taita Falcon Lodge overlooking the Zambezi. For most of us, this is about as close as it gets to feeling like James Bond! It is also a lot more enjoyable than a 3-5 hour return drive by road! 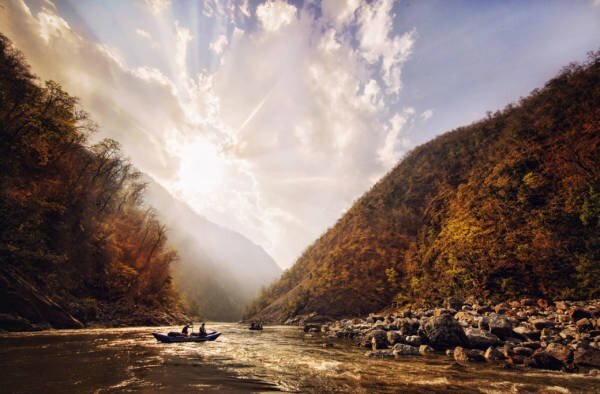 For the perfect conclusion to a classic rafting adventure, this is it! 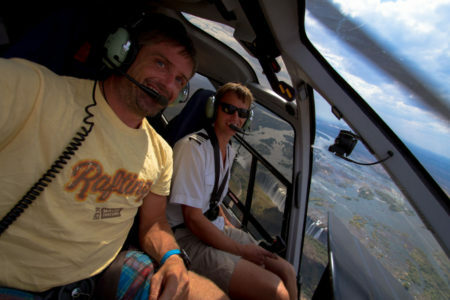 A pretty special flight over Victoria Falls on the way to your hotel. 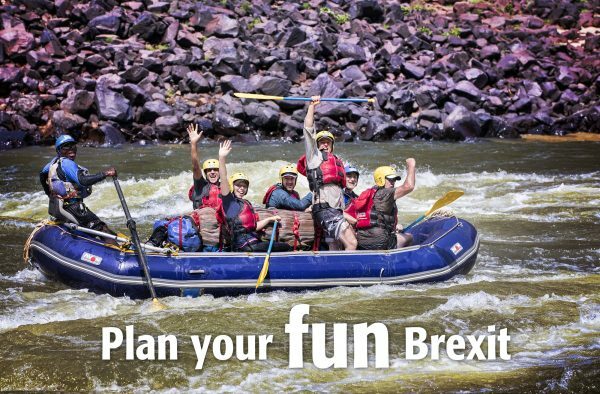 The Zambezi is at it’s best between August and October, when the river is ‘low’ meaning more defined and spectacular rapids. Want amazing adventure for your next holiday? Welcome to the Zambezi.